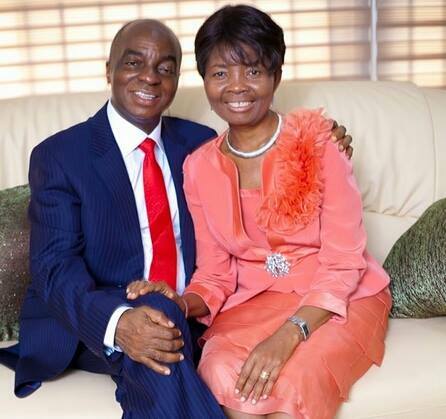 The founder of Living Faith Church Worldwide, popularly known as Winners Chapel, Bishop David Oyedepo, says marriage vows, “For better for worse” which people recite when getting married, is a curse. Bishop Oyedepo stressed that the cliche, ‘for better for worse, in sickness and in health,’ was unscriptural and a curse. Naija News reports that the clergyman’s assertion was captured by a popular Christian page on Facebook, Church Gist. “All that “for better for worse, in sickness and in health”, that people recite as marriage vows, is unscriptural! It is a curse!” Bishop Oydepo said. Oyedepo made this comment while delivering his message at the Faith Tabernacle during the ongoing 20th Shiloh, where he noted that he is dangerously rich, hence he has never received or shared any booty from any government in Nigeria. “I don’t share any booty from any government. I have a clear conscience; I am dangerously wealthy. I am rich, whatever I want, comes. That’s what they call wealth,” the Bishop had said in December 2018.